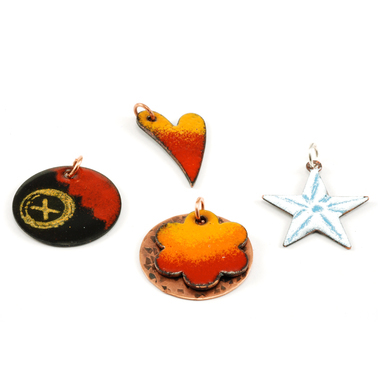 This project is great for those who are familiar with our free online Torch Enameling Class. We took the basics that are covered in this class and added in some copper charms and solderable accents. By enameling the back side first, we were then left to cover the front of the blanks with enamel powder, and then gingerly place our copper components on top of the frit. We then torch everything in place and viola, enamel set letters! 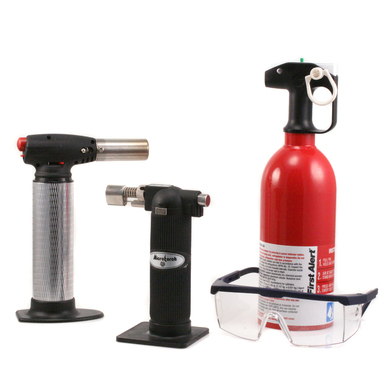 Soldering Starter Kit - $99.00 - We used everything in this kit except the solder for this project. Xuron Maxi Shear Flush Cutter - $18.95 - We used these to cut off the top loop on our script letter. Cut 2, Half Round File - High Quality - $44.05 - We used this to file down the cut after taking off the top loop on the script letter. Copper Elegant Plaque, 40.2mm (1.58") x 19.8mm (.78"), 24g - $0.93 - We used this blank to make the "M" pendant. Copper Mod Plaque, 29mm (1.14") x 16mm (.63"), 24g - $0.83 - We used this blank to create the "love" pendant. Shiny Copper Ball Chain, by the Inch - $0.15 - x 16"